In November 2006, the Town bought the “Horizons for Youth” land, about 56 acres off Lakeview Street to the west of the lake that had been the site of a summer camp. The property comprises beach front, wooded and open areas, wetlands and trails, and several buildings—the Lodge (largest), a recreation hall, an arts and crafts building, an administration building, a nature building, and twelve cabins. These buildings were run down, with unusable septics, when the town acquired them, but the property as a whole has potential for active and passive recreation, and badly needed rental space for nonprofits, small enterprises, retreat groups, and the like. The HFY land abuts the Meadow and King Philip’s Rock conservation lands to the southwest. 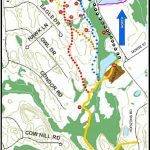 The Boy Scouts have cleared walking trails west of Lakeview Street—collectively the “dot” trails (yellow, red, blue)—for the public to enjoy (see sketch map). There is also a beautiful lakeside walking trail from the Community Center, around the south end of the lake, to the HFY land, which is open to the public (except possibly for a temporary period in summer if the lake front is in use by camp children). Sharon Friends of Conservation will lead an HFY Trails Walk, about 1.5 miles round trip including the lakeside trail and some of the “dot” trails, April 25, 2009. The town’s fourteen-member HFY Committee, chaired by Mike Bossin, is directing the restoration and rental program at the property. It used $133,000 appropriated by Town Meeting to install new septic systems and to weatherproof roofs and windows for the Lodge, recreation hall, infirmary, administration building, and five cabins, and will use a $100,000 state reimbursement obtained by Representative Lou Kafka for further repairs. The area, including some of the buildings, was rented in summer 2008 to Chabad and the Cub Scouts, and dance and music classes are among anticipated rentals for fall and winter. Pop Warner football rents storage space. Rental income goes into a revolving fund, which enables the committee to plan further repairs as needed to expand users, and to pay operating and custodial costs. Only structural/safety (not cosmetic) repairs are being made. “Rentals are for the property as is,” Mike Bossin explained. The Lodge is heated, newly painted and lighted, with a restored tile floor. There is parking nearby for about fifty cars.